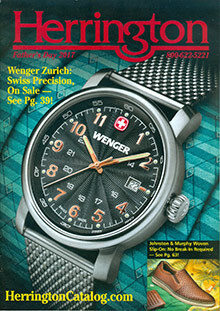 The Herrington catalog offers the best in new gear and gadgets for men and women who appreciate cutting-edge choices. Exciting electronic gifts - From a hand-held 12 language translator to a compact home recording studio that lets you transfer LPs to CDs, their catalogs are full of entertaining and exceptionally useful electronic gadgets and new inventions. Turn your Ipod into a world class stereo, or listen and charge it at the same time while you drive. Outdoor ideas - Enjoy your time in the wilderness with Herrington's collection of outdoor tools, safety gear and emergency supplies. Choose solar powered lights, emergency radios, on-the-go chargers for your cell phone or handy water purifier gadgets to stay safe and in touch in any conditions. Read in bright sun without squinting with polarized magnifying sunglasses featuring built-in magnifying readers. The best shoes and boots for healthy feet - Protect your feet from the elements and your body from the stresses of hiking, running or just everyday walking with Masai barefoot technology shoes Timberland boots or Merrell's line of ultra comfortable boots and shoes. High tech apparel - Stay warmer, cooler, drier and more comfortable in any weather in the Herrington Catalog collection of high tech apparel. Their unique copper-infused socks prevent fungi, while Cloudveil's Mountain Vibe Sweaters give you the warmth of fleece with the look of a fine wool sweater. The watches you always needed - For all the times you needed a watch that kept truly accurate time, kept you up to date on the time around the world, and resisted the ravages of water, sun and sand, Herrington catalog has gathered a collection of truly exceptional watches that finally do what you want a watch to do. On the go gadgets - Stay in touch and organized on the road with their collection of automotive and travel gadgets for men and women. Choose useful electronic gifts like emergency phone chargers, practical auto accessories like custom-fit cargo bed liners, or timesaving travel gadgets for easier packing, faster security checks, or more comfortable hotel stays. Whether you shop online at www.herringtoncatalog.com or order their catalog for shop-anywhere convenience, you'll find the things to make your life better at Herrington catalog. From the natural support of Masai shoes to the beauty of an ultra-thin Skagen watch, they bring the best of the world's innovations to your door.